Those that have clapped their hands over their ears and refused to acknowledge global temperature increases have yet another scientific study to ignore. The ‘deny-o-sphere’ attitude continues to spew forth their own versions of the facts, which they insist is just the normal cyclical climate changes of the world. Scientists around the world are now confirming that that temperature spike that has affected the earth has exhibited higher numbers in the last century on a faster level, than ever before. 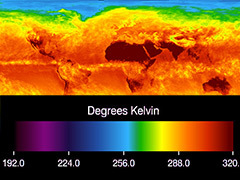 The researchers of the latest study examined earth temperatures spanning one hundred centuries. They included global anomalies and deviations to establish a standard or average temperature and examined seventy three sites around the planet, using the sediments of fossils as a temperature proxy. The isotopic and chemical composition of the fossils is one of the most accurate measurements of the temperature of the environment during the time of existence of those plants and animals. The resulting information found in the study was, to no one’s surprise, quite shocking. In the past five thousand years, the Earth actually experienced a cooling by around 1.3 degrees Fahrenheit, however in the last one hundred years, the earth’s temperature had a spike that equated just about the same level. The data is clear; the global temperature is warming faster than previously thought and this information goes back to around 11,300 years. This rate of warming also showed that the planetary temperature is currently warmer now than it has been for seventy to eighty percent of the past. The bad news is, that the importance doesn’t lay in the current temperature, but what the temperature is actually doing. Apparently, it is on a path of skyrocketing faster than before and isn’t showing any evidence that it will slow down. The bad news for us is that the anomaly projection for our future is worse than we thought and we are in for much more trouble than we are even experiencing now. Posted on July 25th under Global Warming Issues.